Were you always interested in textiles? Yes, I was bought up on a farm in Dorset which was a very making/doing type environment. My mother was always cooking, knitting or making our clothes and that rubbed off on me. As a teenager I became interested in fashion and started making my own clothes, ending up at Yeovil Technical College doing a general art and design diploma. I then went to the London College of Fashion but transferred after a year to St Martin’s, where I completed a 3 year degree in Fashion & Textiles. When did you first start quilting? After I left St Martin’s I spent three years designing clothes – really in the thick of the rag trade – but I didn’t really like it so gave it up and as an in-between project took a stall at Portobello Market. My boy friend at the time dealt in second hand books, he gave me books on patchwork as he could see they held my interest, from this I started making my own pieces – so I really just taught myself. What was it about patchwork and quilting that so appealed to you? I really enjoyed working purely with colour and fabric and liked designing repeating patterns. I also liked the fact that it was two dimensional and that you only needed to think of it as a flat surface – it was a lovely, straight forward way to work after my time in fashion. I also loved the fact that it was my own thing and nothing to do with what I had been doing at college. Of course, at the time I didn’t realise the value of having an art degree behind me which helped me the moment I started designing and making my own patchwork. What were your first quilts like? Right from the beginning they were large scale but to start with they were made using traditional block piecing techniques. I think my first quilt was made out of black and white traditional maple leaf blocks. I then began making my own blocks, using images of things I found in the market – say a brooch – and turning them into geometric shapes which I could use as a block for the fabric. At one point I spent some time at the British Museum sketching motifs in the Egyptian Galleries – a quilt based on this imagery was put on the front of Crafts Magazine in June 1980 which was great for my confidence. How did your work develop? I was still working with geometric block pieces until the mid 1980s when I started working with torn paper collage. It was a lot freer way of working and helped loosen up my approach. I was no longer piecing together a patchwork from individual blocks, but was using collage and applying material to a base cloth by stitching and gluing. I started using templates for the fabric but the process developed into free-form collage and I just ended up chopping up the fabric in any way I liked. How much planning do you do before you start each piece? At the start of my quilt-making career I used to plan each piece out carefully on graph paper which I would then scale up, but as my work has got freer and freer my pre-drawings have got rougher and rougher. Now they are just rough technical planning drawings. I work directly with the fabric and make decisions as I go along without any pre-determined ideas about how the work will look. I visit places that inspire me and take photographs and make sketches while I’m there – drawing is an important part of my work. 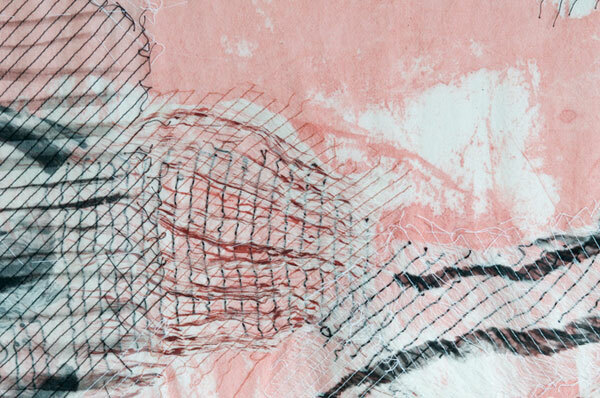 I then begin to work with the fabric and the fabric landscape takes over. 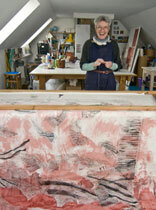 I mainly work with collage, with the different fabrics applied to a white cotton base cloth. 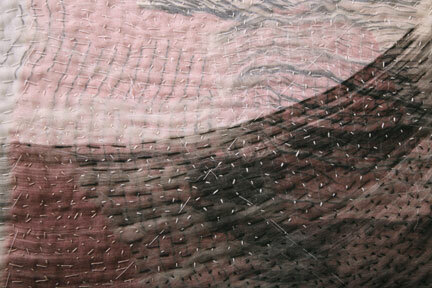 I now use painted transparent fabrics as well as coloured fabrics to build up overlapping layers of material. I love having layers in my work as I feel they reflect the landscape and its layers of history. I use both hand and machine stitching. I pleat some of the materials I use and then flatten them out again to give a bit of texture to the piece. The entire process of making one big quilt may take up to eight months. How do you finish the pieces? When the image is complete I put it over a layer of cotton wadding and a backing material so it actually has the same three layers of a tradition quilt, although the pieces are designed to go on a wall not on a bed. This backing helps the quilts hang better, but also it underlines the links my work has with traditional quilt making, although my techniques are my own contemporary interpretation of traditional techniques, and my imagery is quite personal and not traditional at all. 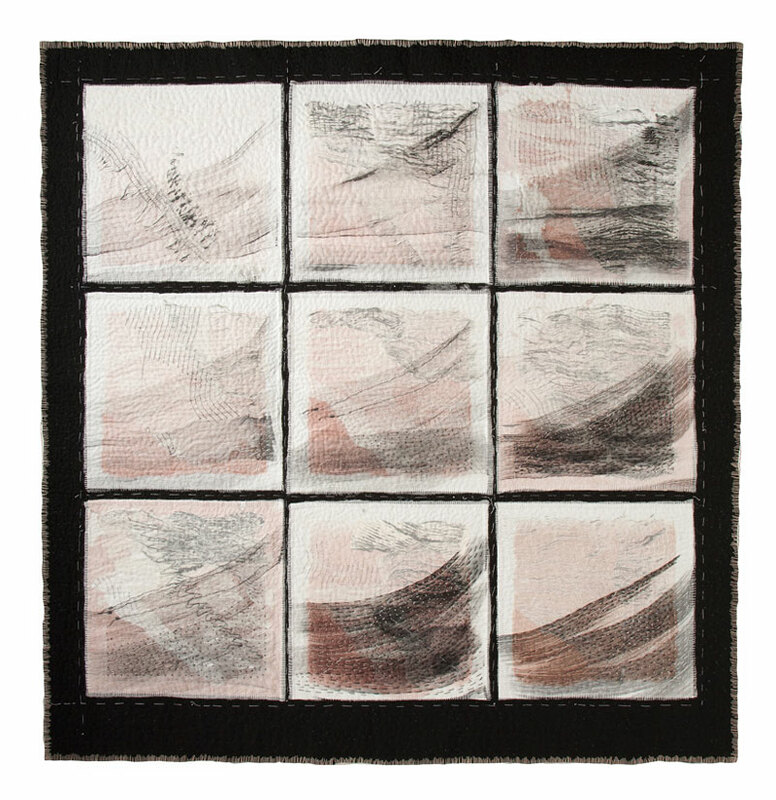 How do your stitch drawings differ from your studio quilts? These are pieces I have developed fairly recently. They are often framed and are much smaller than my studio quilts (about 40cm square rather than 2 meters square) and much quicker to make. I started making them after I gave up teaching workshops (I realised I preferred being in my studio to teaching) and needed to develop a cheaper, designer-maker range which was more commercial. 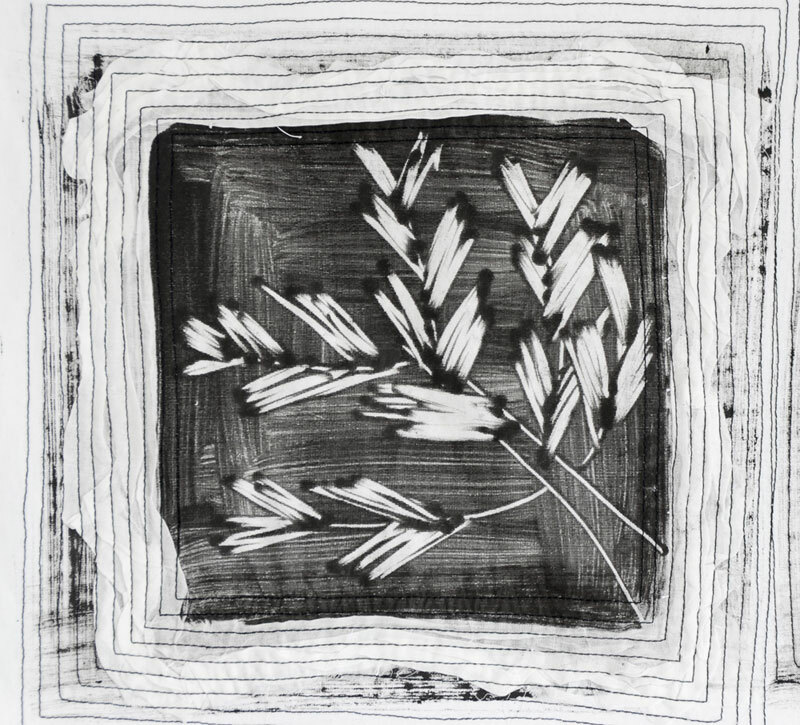 The pieces are machine and hand stitched – they are like drawings in stitch – and I then paint them afterwards. I am having a big retrospective exhibition called ‘PB RETRO:Interpretations in Cloth’, this summer at the Festival of Quilts in Birmingham in August, which will then tour to the Quilt Museum in York, and I am currently working on a large-scale piece for the show called Lindesfarne Revisited.